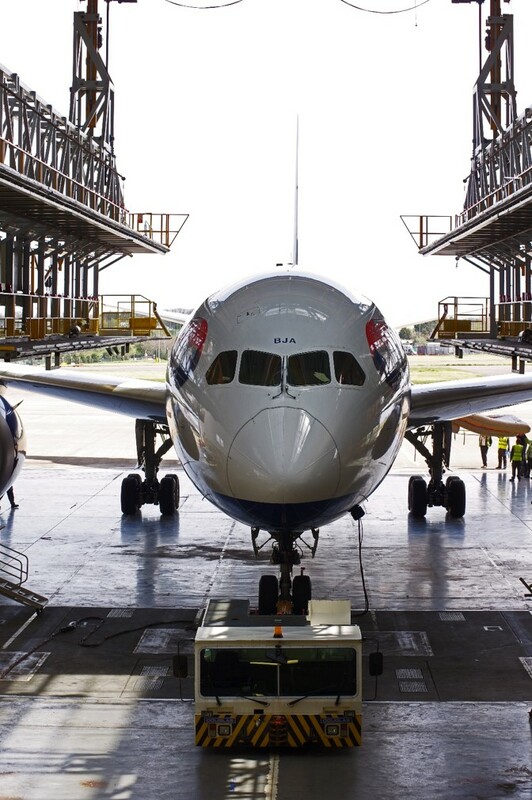 British Airways’ team of expert engineers at Cardiff has welcomed one of the airline’s 16 Boeing 787 Dreamliner aircraft for the first time for planned maintenance. The aircraft recently arrived at British Airways Maintenance Cardiff (BAMC), the airline’s long-haul aircraft heavy maintenance facility in South Wales, for a planned 12 day ‘B’ check, conducted every three years. The in-depth inspection was successfully completed by a specially trained team of engineers and included emergency evacuation slide checks, engine ground runs, and a top to bottom review of the cabins, which saw all of the seats removed and transported to British Airways’ Interior Engineering (BAIE) in Blackwood for a full overhaul. Preparation for the aircraft almost a year ago with dedicated 787 training programmes for BAMC experts including mechanics, technicians and safety specialists. The facility now boasts more than 120 specialists with the specific training to work on the 787 aircraft fleet. Sixteen of the airline’s licenced aircraft engineers have successfully completed the intensive 45-day 787 course allowing them to certify the maintenance work carried out at BAMC. The aircraft, with the registration G-ZBJA, is the airline’s first of a total of 42 Boeing 787 Dreamliners on order. All 42 of the airline’s ordered Dreamliners are planned to arrive with the airline by 2021. British Airways 787 fleet currently fly to destinations including Toronto, Austin, Hyderabad, Montreal, Chengdu, Philadelphia, Seoul and Chennai. The aircraft will service British Airways’ new direct service to Santiago, Chile from January 3, 2017.